This second part will be a bit more about the trip we had. I had the pleasure of travelling with Mathias Peterson from Sigfreds Kaffebar in Aarhus, who we are proud to say is now solely using our coffee. We began our trip with morning cupping sessions at Dormans in Nairobi, together with Bridget, Kennedy and Daniel. Lots of AAs and AB, which were going on the aution the following day. At first we were quite surprised how low the quality was on most of the coffees, but since this was the first auction of the season, everything was early crop. We were happy to hear that harvest this year is very big, more than double the year before and there’s a high percentage of AA. After the cupping we became a bit concerned that maybe we had arrived too early. The early pickings just don’t taste as good as what come in later, in our experience. But two coffees stood out in that first cupping; Kieni and Karatu. However, we would see later that for our coffees the timing was perfect. In the afternoon we drove up to Nyeri to the Central Kenya Coffee Mill, where one of my favourite cuppers is to be found; Ernest Njuguna. Not only is he a great cupper but also a very nice and laid back guy. We immediately started making a list of coffees to cup early the next morning. We selected 12 coffees based on Ernest’s recommendations, our previous experiences from cupping there and from the cupping at Dormans. It was hard to narrow it down to 12, but we managed. After several visits we have a pretty good idea about which facotries we like, and Ernest cups everything that come through the mill, so he knows which coffees are good. We had coffees from several societies, including Mugaga, Tekangu, Murue, and Gikanda. We decided to blind cup the coffee the next morning, not to be biased towards certain factories. All the coffees except two were really good. So good I would be happy to buy and roast them. Four of them were exceptional. And three really stood out for us. The first one was super sweet and clean and classic top Kenya, with black currant and blackberry notes. But it has an extra layer of a deep floral aroma, somewhat like Jasmine but even heavier (I’m not that strong on flowers, sorry). The second was intensely aromatic and with the best acidity I’ve tasted in a long time. Citrus, gooseberries, elderflower and a vibrant, mouth watering acidity. The last one was more full bodied, syrupy sweet with bergamot/orange peel aromas. We pretty much went nuts over these coffees. So I couldn’t help smiling like an idiot when we turned the bags and the coffees were Kieni, Gichathaini and Karatu. The same two coffees we bought last year plus a new one. I was glad to have both Ernest and Mathias there who had agreed with me before, so I couldn’t just write it off as being used to the taste profiles of Kieni and Gichathaini. We decided to do a second cupping, with the best ones and e few new, plus three different lots from Kieni - and also to find a coffee specifically for Sigfreds. 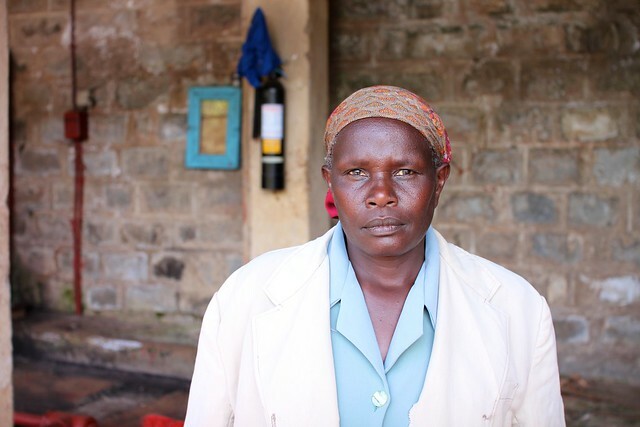 The past three years, they’ve had coffee from the Murue Society in Embu. Another district about 100 km east of Nyeri. The factory Kianyangi, where they bought from last year, won the regional award for that area. But the Karatu really had caught his eye and just tasted amazing. Both Casper and I had loved that coffee the year before as well and know they deliver amazing quality. In the second cupping it was again clear which coffees we wanted. And that the first picked lots didn’t cup nearly as well as the later ones. So our timing turned out to be great. Although there was only one or two lots in from the Tekangu society factories, all but the final picking was in from Kieni. And since we needed a lot more coffee than last year, we had to take two full week lots of AAs. 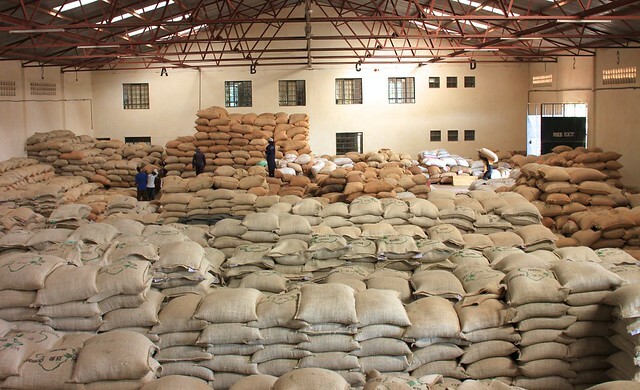 Of course it would have been nice to cup all the coffees from the other societies as well, but we’re very happy that we’re able to continue to buy and support the Kieni and Gichathaini factories. In the afternoon we got a tour of the demonstration plot that the agronomists, Philip Kamau and Philip Home, use to teach farmers about good growing practices. Philip & Philip are very kind and knowledgeable people and showed us a lot of stuff about how to germinate and grow coffee, insects, pests, fungi, keeping water at farm level and pruning. I could have written a whole blog post on that subject alone. The rest of the days, after morning cupping sessions, we went to visit the different factories and societies. 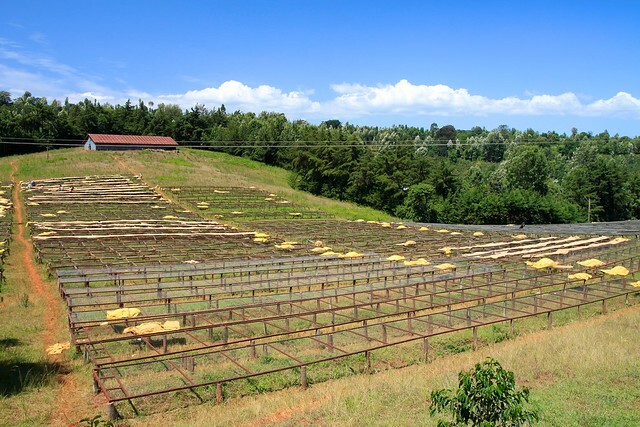 So as mentioned in my last post, Kieni is part of the Mugaga Farmers Cooperative Society Ltd. Kieni currently have around 900 active members, who elects the board and chairman. Total production this year (2011/2012) up to the week we visited was 561.740 kg cherry plus another 15.000 on the way from the very last picking, where the trees are cleaned. That will amount to around 1.500 bags green coffee for export total of all sizes and grades. They were getting close to 50% AA out of that though, which is really impressive. Peter Macharia is the Factory Manager. In a lot of the societies the factory managers rotate on a two year basis between the factories. So Geofrey Wanjau, who was there the last two years we visited is now at one of the other mills (don’t know which one). The factory manager really is key to the success, and we heard good things about the very experienced Peter. It’s part of his job to help educate the members and he’ll determine which days the member should pick and deliver cherry to the mill. He oversees the depulping, fermentation, washing, drying and resting. So naturally we feel we should thank him for a large part of the quality we experience on the cupping table. Charles Musai Ihatu is the Kieni Factory Chairman. 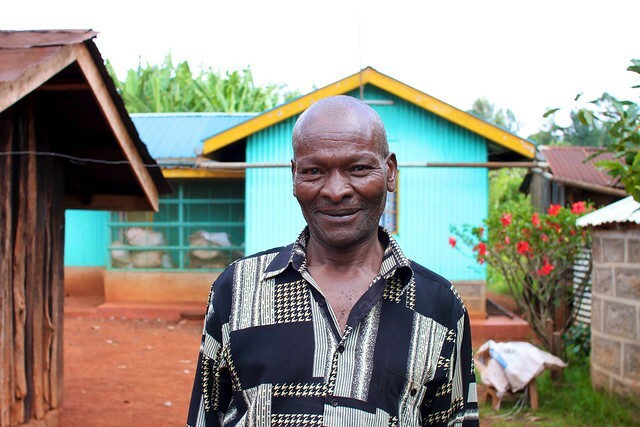 He’s a very tall guy with a clear sense of the importance of continuously developing the quality of the coffee to make sure that Kieni can sell to buyers like us. We met him several times last year and also got to cup with him. First fermentation in first row of tanks, from afternoon/evening till next morning, approx 10 hours. Intermediate washing. After the first fermentation the coffee is washed with clean water while it is moved into a second fermentation tank. According to one of the agronomists around 80-90% of the mucilage (that sticky sugar goo that surrounds the parchment bean) is removed in this process, but especially at that little line in the middle of the flat surface of the bean, there’s some left. Some mills only have one set of fermentation tank, which can be perfectly fine, but makes the intermediate washing somewhat more difficult. Second fermentation, somewhere between another 10 and up to 48 hours. The last bit of mucilage will be easily removed by then, and of course it’s important that the coffee doesn’t over-ferment. Final washing in washing channels, and grading. The grading done here is by weight of the beans. The lighter ones will flow on top and come out faster at the end of the channel. The coffee is here separated in Parchement 1 (better) and Parchment 2. Again, washing at this stage requires lots of water, and especially that all the water from fermentation and washing is cleaned before being let back into nature. Fortunately this is law in Kenya. Soaking tanks. Here the coffee is left with clean water for 16-18 hours. Earlier I’ve heard up to 48 hours. The purpose of the soaking tanks remains somewhat a mystery to me. It acts as a holding place for the coffee if there isn’t space on the drying tables. But how it affects taste has not yet been clear to me. Drying tables. The coffee is pumped from the soaking tanks up to the drying tables, where it dries for around 10 days to a humidity content of close to 11%. So as you can see the whole process can take up to 72 hours. I’d like to point out straight away that all the above numbers are approximate. As any farmer or miller will tell you it all depends on when the coffee is done, which will vary a lot depending on temperature, humidity, and so on. But actually, this year I was more interested in getting to know more about the work that the farmers do. So we went around to visit some of the member of the Kieni factory and talk to them. One of the farmers we visited was John Githaga Murage. He is member no. 2016 of Kieni and his farm is right next to the mill. On it he grows beans, maize, banana, mango, avocado and of course coffee. He has around 800 coffee trees. Besides the crops he has a few cows and pigs that also provide manure for the trees. When he bought the farm back in 1983 there were rocks everywhere. He had to move a ton of rocks (literally) to make the soil ready for growing anything. Walking around the farm you see that it’s still quite rocky compared to the deeper clay in other areas, but it’s hard to imagine there wasn’t coffee and banana trees growing there. Now he says the land is very fruitful, with good yields from all his plants. From the 800 trees he got around 3000 kg cherry, which isn’t bad, but not as high a yield as some of the other farms. Usually agronomists and farmers are very keen to get a high yield as it signifies healthy trees and of course will give more money to the farmer, but we also speculate whether lower yielding trees might give better taste quality. In wine production you sometime remove grapes to allow more nutrients to the remaining. But of course you have to have a tree that is capable of providing enough nutrients before you would get a better taste quality. Picking begin in October and ends December. This year it went a week into January though, because of rain in beginning of December, which delayed the harvest. In Kenya you have two harvest cycles and the other is called Fly Crop, which is harvested around May and usually is of a lower quality. John was an amazing guy to meet and talk to, and I was glad he spoke English as my Swahili is… well… not quite there. He stressed that a few years ago he was planting more banana trees and considering uprooting his coffee trees. Prices had been so low that it was just not worth it. But the past couple of years, prices have gone up and he feels ready to produce great coffee again. 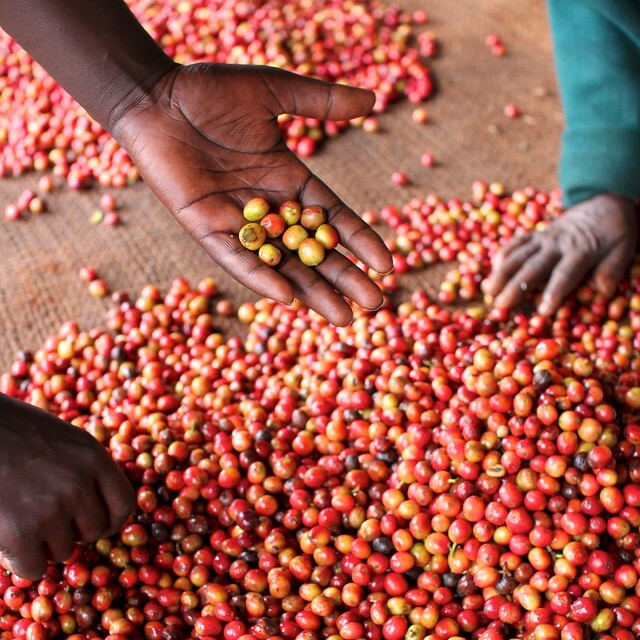 ”Farmers want to make great coffee. We just have to get the right price for it!” as he said, several time. Couldn’t agree more. We visited a few more farmers afterwards. At Peterson Muliuki’s farm we saw how the trees are cropped. His trees date back to 1956 but every 7 years they need to be cropped, or else it won’t produce enough cherry or the quality will drop. What really impressed me was the sixe of the old trunk at the bottom. The root system is from 1956 and gone very deep down into the soil. In theory it is capable of supplying a tree that could grow 10 meters high, but because of stumping and cropping, it can supply the remaining stems and ultimately cherries with nutriens and water from a much larger and deeper area. From his 760 trees he this year got between 4.600 and 5.000 kg cherry. The president of the Gikanda Society and their bookkeeper welcomed us to their beautiful office building, next to the Gichathaini mill. We talked for a while about the new projects they have going, Rainforest Alliance being one, and drank coffee. Unfortunately the coffee was a generic blend of Mount Kenya Coffee, but they had both a Skerton hand grinder and French press to brew it. We talked quite a long time about prices and Direct Trade and their bookkeeper showed us detailed accounts of the previous years’ harvest and the finances of the society. Gikanda is definitely amongst the most well run and organized society I’ve seen in Kenya. After coffee we toured the Gichathaini mill with the factory manager Veronica Wambyi Muibiri. I first visited Gichathaini in 2007, before their impressive offices were build. Most of the mill itself hasn’t changed since then. They have however gotten a lot more drying tables since then and most of them in metal. We also visited several other factories, Tegu, Gatina and took a day to drive to Embu to visit the Murue Society and their four mills: Kavutiri, Gituara, Kianyangi and Ngurueri. 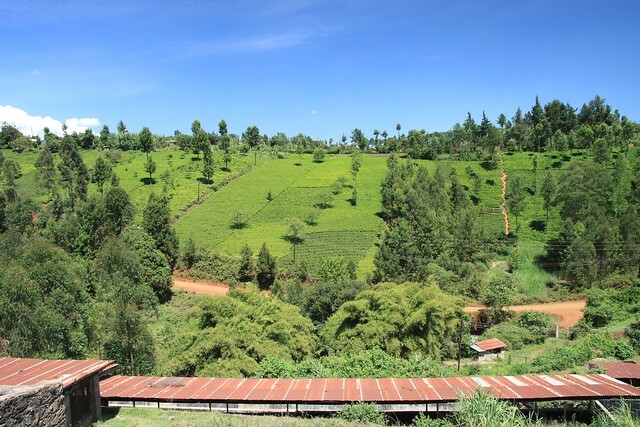 It’s a lot closer to mount Kenya with lots of tea growing in the higher regions. Generally coffee grows up to around 1.800 masl and tea above that. It was quite interesting to see the tea plants about which I feel I know very little. On our last day we wanted to visit Karatu, part of the Gitwe Socitey. It is in the Thika region, about 60 km north of Nairobi, close to the town Gatundu. The factory was started in 1963 under a much larger society. In 1995 the Gitwe society was formed and Karatu became part of it. 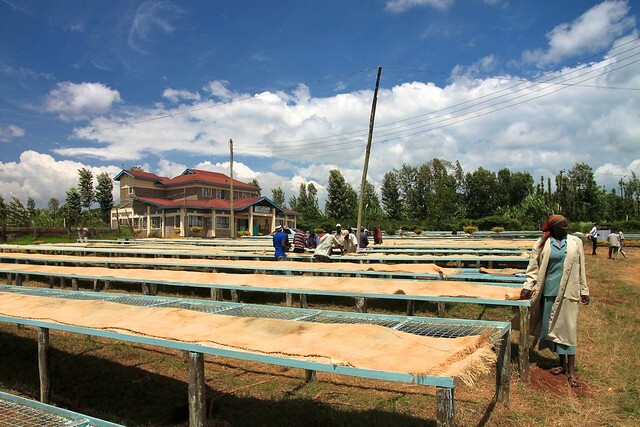 The other factories are Karinga and the brand new Kifiru, which is delivering the first coffees this year. There’s 2.156 total society members and 636 members of Karatu factory. Surprisingly to us, they had actually harvested less this year than anticipated after flowering. Frost and hail in October had destroyed some of the cherries, the manager of Gitwe society George Kib Njoroge told us. The harvest is still much better than last year though, so they weren’t worried. 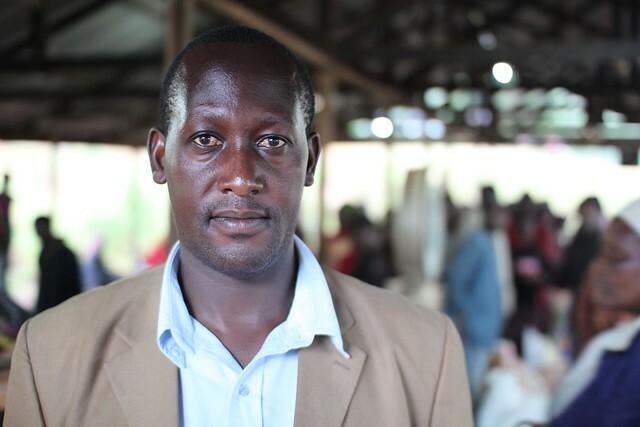 The Karatu factory manager is David Kanya, who this year has overseen 262.000 kg of cherry. This coffee is for Sigfreds Kaffebar in Aarhus, who will soon open their third coffee shop. 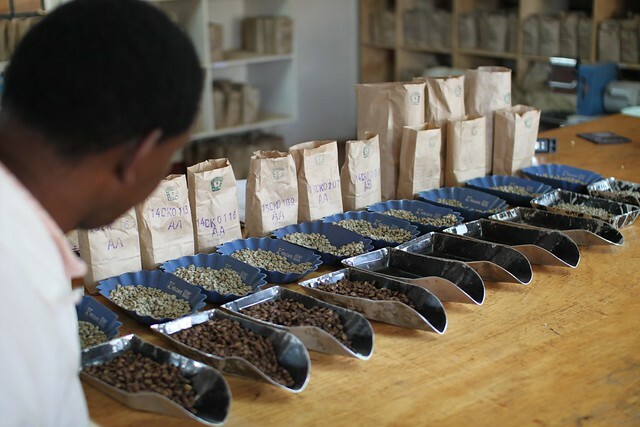 Thomas Sigfred is very devoted to developing quality and especially to Direct Trade. When you buy Direct Trade you of course have to pay for the full amount straight up, when you enter the contract. Thomas therefore has decided that he will pay for the green coffee himself, to be even further involved with the farm. For the same reason we’ll also want to keep this coffee exclusive for Sigfreds kaffebar, so we make sure there’s enough for his customers. We’re really looking forward to roast it though. On our last day in Kenya we took it pretty easy and enjoyed the warm weather before returning to sub-zero degrees in Denmark. But on the way to the airport we were chatting with the taxi driver, Patrick Nyagah, who we found out was a coffee farmer as well. It turned out to be a really interesting conversation, and a little bonus to the trip. He had taken over part of the farm with 300 coffee trees after his father’s death. 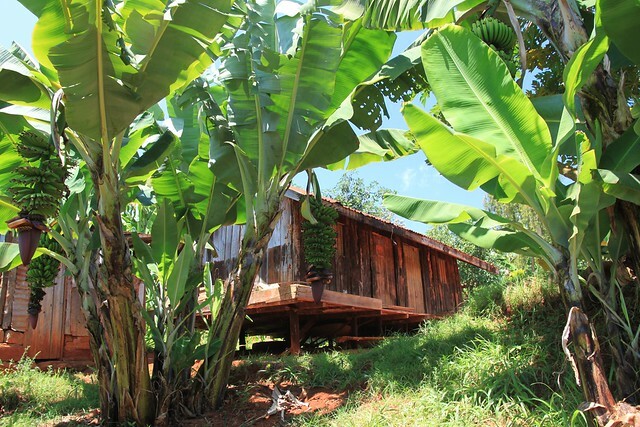 Because of the low prices for coffee he had changed part of the farm to banana trees, but now that prices were good he wanted to return to more coffee. The problem of course is that it takes several years from planting a coffee tree till you get a good yield. We also talked about the importance of picking only the ripest cherries. He actually didn’t pick the coffee himself, but hired pickers for it. He said, they are very poor people and he pays them as much as he can, which is 60 ksh for a container of 20 litres. This was pretty much in accordance with what we heard at Kieni, but it was a good reminder for us to keep paying good prices and make sure the money gets to the farmer. 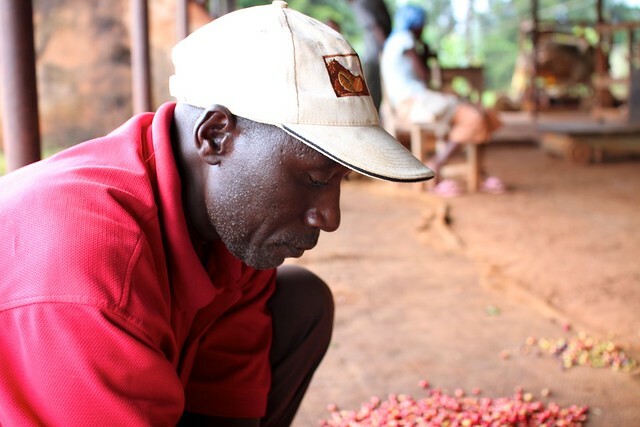 We heard over and over again how much farmers appreciate Direct Trade and that it means a lot more money to them, compared to when the coffee goes on the auction at the Nairobi Coffee Exchange. I think both Mathias and I left Kenya with a feeling that we need to make more consumers as well as roasters aware of the possibilities with Direct Trade, so we can keep getting these amazing coffees from Kenya. Thanks for the great coffee pictures and a good read! Fun trip! Thanks for sharing them with us and the beauty of Kenya.